With the exception of "Saturday Night Live," broadcast shows were shut out of the top awards as 21st-century platforms continued to overshadow traditional network fare like "This Is Us," among the also-rans. HBO, which had ceded its top-dog status in total nominations for the first time in 17 years in July (108, to Netflix's 112), ended up in a tie for wins with the streaming service at 23 each. "The Marvelous Mrs. Maisel," a freshman sitcom about an unhappy 1950s homemaker liberated by stand-up comedy, earned best actress honors for star Rachel Brosnahan. Her castmate Alex Borstein earned the supporting actress trophy and the series creator, Amy Sherman-Palladino ("Gilmore Girls"), nabbed writing and directing awards. "This wasn't supposed to happen," said a startled Foy. She played the young British queen who, as the series continues, will be shown advancing in years. "Game of Thrones," which sat out last year's Emmys because of scheduling, won its third best drama trophy despite competition from defending champ "The Handmaid's Tale." "Thank you for letting us take care of your people," ''Game of Thrones" producer D.B. Weiss said to George R.R. Martin, whose novels and their characters fuel the drama. Neil Rosen shares his Emmy predictions. 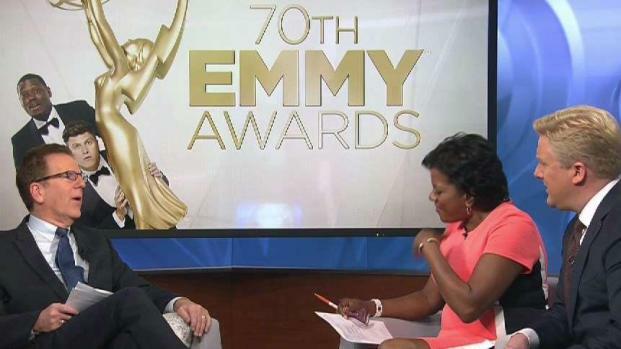 Watch the Emmys on Monday at 8 p.m. on NBC 4 New York. In a ceremony that started out congratulating TV academy voters for the most historically diverse field of nominees yet, the early awards all went solely to whites. An African-American sweep of guest series actor awards at the recent creative arts Emmys suggested big changes ahead for the awards, which only recently have given significant honors to performers and creators of color. But there was disappointment for "Atlanta," which had claimed acting and directing trophies last year for its star and creator Donald Glover and seemed poised for more with 16 nominations. Rather than become the first black-led comedy in 33 years to be named the best (since "The Cosby Show" in 1985), "Atlanta" was shut out Monday (it won two awards, including guest actor for Katt Williams, last week). The showing by "Mrs. Maisel" extended the long winning streak of shows that focus on white lives, including "Modern Family" and "Friends," with ethnic minorities rarely given screen time. "Let's get it trending: #EmmysSoWhite," presenter James Corden joked at the ceremony's midway point. "I feel like a lot of times we are so divided as a country that things are always black and white. I'm guilty of that a lot of times. I think that probably played into my assumption the chances of me winning was so small," King said backstage. Darren Criss, who is of Filipino descent, won the lead acting award for the miniseries "The Assassination of Gianni Versace." Black actress Thandie Newton won best supporting drama actress for "Westworld." Peter Dinklage added a third acting trophy to his collection for "Game of Thrones." The biggest award won by a broadcast network was "Saturday Night Live" for best variety sketch series. 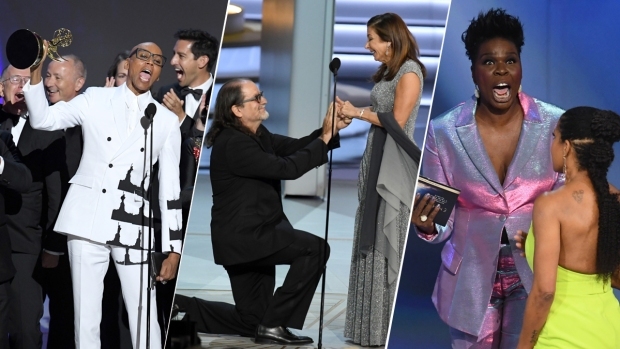 The Emmys kicked off with a song, "We Solved It," a self-mocking celebration to the diversity of nominees sung by stars including Kate McKinnon and Kenan Thompson. The tune included a mention of Oh's possible victory: "There were none, now there's one, so we're done," the comedians sang. The ceremony clearly bore his stamp, with Michael Che and Colin Jost as hosts and familiar "SNL" faces, including Kate McKinnon and Alec Baldwin, as presenters and nominees. The long-running NBC sketch show, already the top Emmy winner ever with 71, won again for best variety sketch series. The pressure was on Michaels because NBC and other broadcasters are increasingly reliant on awards and other live events to draw viewers distracted by online options. The networks, which air the Emmy telecast on a rotating basis, are so eager for the ad dollars it generates and its promotional value for fall shows that they endure online competitors sharing — and dominating — the stage. AP Writers Jonathan Landrum, Mike Cidoni Lennox and Leanne Italie contributed to this report.